Restore Ubin Mangroves (R.U.M.) Initiative: What do the villagers think of Restoring Ubin’s Mangroves? What do the villagers think of Restoring Ubin’s Mangroves? To the R.U.M. team, it is vital to consider villagers’ views in designing mangrove restoration on Pulau Ubin. 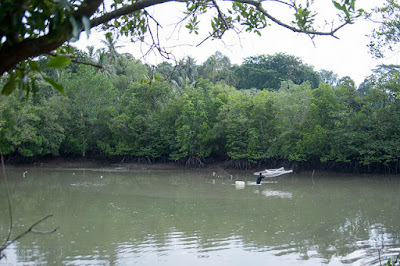 The villagers have intimate knowledge of mangroves and know what it was like in the past when mangroves were abundant. We want to gather their thoughts and ideas so these could be incorporated in the restoration project. Mr Tiong (a fish farm owner on Ubin) who kindly let us interview him. To find these out, Tessa Liu, R.U.M intern, interviewed Ubin villagers in December with the help of R.U.M volunteer Jared Moore (who is also a Master’s student with NUS Geography). They are grateful to Phillip Lim of Sea Angels and Mr Yong for introductions to villagers, and Sia Wanrong for introductions to the fishermen. As it was a weekday, most of the villagers were out working on the mainland or were out running errands. Thus it was a bit of a challenge trying to find villagers who were at home to be interviewed. A total of about 20 villagers and fishermen were interviewed. most villagers either spoke Chinese or Malay, so results have been translated into English. The villagers interviewed were mostly above 50 years old. Most lived on Ubin for at least 10 years, the rest having lived on Ubin all their lives. One Ubin villager was very knowledgeable and named the mangrove species in malay. While the rest could not name the species in malay or chinese, they could differentiate the species and share the different uses of some kinds of mangrove. For example, they would share how they could catch crabs among the prop roots of some trees. The villagers exploited mangrove resources in the past. Most of them noted a drop in seafood (especially mud crabs, prawns and lobsters) after Pulau Ubin lost its mangroves. Villagers actually used to catch and eat fish and crabs in the mangroves. They also cut down the mangroves and used the wood to cook. Those living near the mangroves also noted that there was less flooding in the past as the mangroves helped to buffer against high tide. During the interviews, it was also mentioned that there was a kiln in Johor in the past and many Ubin villagers used to be woodcutters; so they would cut down mangrove trees to be transported to Johor for a living. All the villagers want to restore the mangroves due to the usefulness of mangrove trees. They all see the value in restoring the mangroves as they want wildlife, especially fish and crabs to return as it will boost their livelihoods. Moreover, they want the mangroves to protect Ubin’s shores and reduce flooding. A few villagers have also expressed that they feel joy when they see the trees as it brings them a sense of peace. Mr Tiong sharing on what Ubin was like in the past when mangroves were abundant. When asked what kind of trees they wanted to see being restored, the villagers agreed that they wanted more variety, even fruit trees were welcome. They want more trees since it will benefit the environment. They also agreed that it would be good to open up the restoration area for educational purposes to teach future generations on the importance of mangroves. As R.U.M. was also concerned whether the villagers were comfortable with the restoration, we asked whether they would feel disturbed by the restoration works and if they would be bothered if more people were to come into Ubin when the mangroves were restored. All the villagers wanted more tourism on the island as it would benefit the local economy since most of them owned small businesses in the town area or outside of the town area. They agreed that it would be good to have more information on mangroves to educate people coming to Ubin. 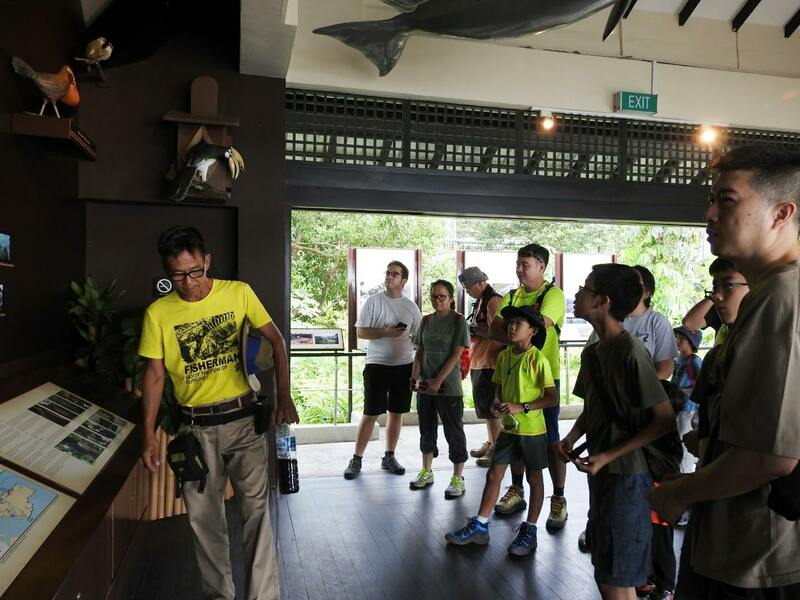 There were also suggestions on using Ubin as an outdoor classroom for school field trips; and the villagers themselves were more than welcome to the idea of interaction with the public as most of them have knowledge and stories they want to pass on. Phillip Lim sharing stories of Ubin during a R.U.M. monthly walk. Besides the villagers, interviews were also conducted with fishermen (at changi mooring) who used to fish at Ubin since R.U.M. aims to restore the mangroves for functional purposes as well. Interview with Mr Yong one of the shopkeepers/ residents on Ubin. The fishermen, like the villagers identified a loss in lobsters, prawns and crabs after the mangroves were removed. They would very much like for the mangroves to be restored so as to restore crustacean catch. They too used to catch prawns and crabs in the mangroves, but are unable to do so anymore due to a lack of mangroves which have open access. Fisherman casting a net in the mangroves of Ubin. Currently, the fishermen go out further around Pulau Tekong to fish, but they agreed that if mangroves were restored and if catch increased as a result, they would definitely go to Pulau Ubin to fish as it is nearer and more convenient (considering Changi mooring is opposite Pulau Ubin). They also want the mangroves to be more open to them as most mangroves currently have restricted access. All in all, R.U.M. received very positive feedback from the villagers and fishermen. It is heartening to know that everyone wants the mangroves to be restored and for the future generation to receive education about mangroves!